Looking for help with your Maui bike vacation planing? West Maui Cycles loves to help plan Maui bike vacations and set up bike riders with a Maui bike rental matching their choice of riding styles. Please leave comment about Maui bike rides or questions about Maui bike rentals in the comment section below. 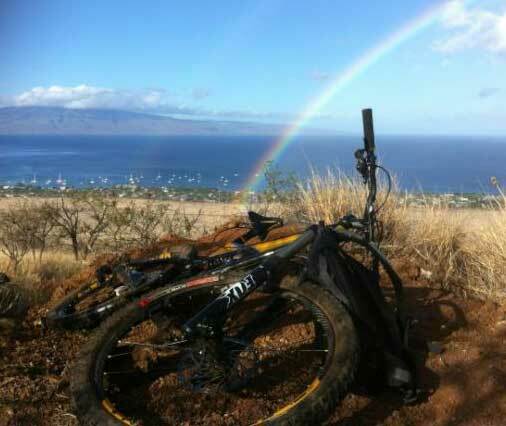 Maui bike ride with rainbow at top of trail. Performance Maui bike rentals. Looking for more Maui mountain bike ride information? Follow these links to Maui bike trail information with maps for Haleakala State Park bike maps, Makawao Forest Reserve Bike trails maps or for Poli Poli State Park bike trail maps. Or, try the Olowalu Petroglyph bike ride and have lunch at the new Leodo's pie shop on the way back. Subscribe to our Maui Bike Blog for more Maui bike ride videos and bike tips intended to make your Maui bike ride fun. And, if you can't get to Maui, we hope you will at least enjoy the bike blog articles offering general bicycle maintenance advice, mountain bike ride and performance road bike videos. With the holidays approaching, don't forget to order a West Maui Cycles bike jersey or hat.